Box of Tricks is looking for expressions of interest from freelancers and small companies who may be interested in sharing our creative office space. 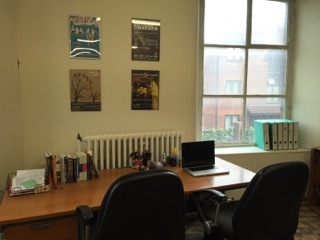 We have a large office at Hope Mill in Ancoats with desk space available for 2-3 people. Address: First Floor, Hope Mill, 113 Pollard Street, Ancoats, Manchester M4 7JA. 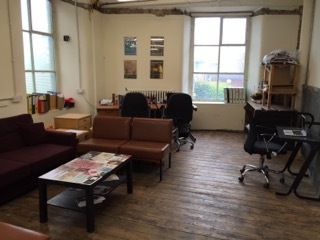 Our office is in a characterful old mill building with original wood floors and large windows offering lots of light. There is free onsite parking and we are only a 5 min walk from New Islington tram stop, which is in city zone 1, and 3 mins from Piccadilly. 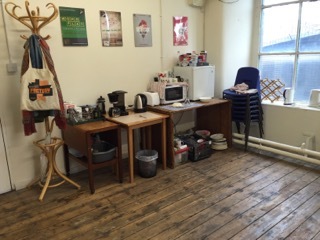 Our office has tea and coffee making facilities, as well as a fridge and microwave. Access to toilets and shower. The office has a breakout meeting space of sofa and soft seating. We are lucky enough to have the Engine Room Cafe (based at Hope Mill Theatre) downstairs, offering sandwiches, paninis, cake and great coffee. Box of Tricks is a new writing theatre company and you would be sharing a space with Adam and Hannah, Joint Artistic Directors, and Associate Producer Amy. Rolling monthly contract, no minimum term. £250pcm inc all bills and internet. Negotiable rate for a single desk.